Randy Cooper, your District 5 Liberal candidate, offers a knowledgeable, vocal and persistent voice for Mermaid – Stratford. A graduate of Holland College, Randy brings a wealth of experience to the District, working in the family business at Cooper’s Red & White in Eldon, and then in sales and management roles from 1996 onwards. 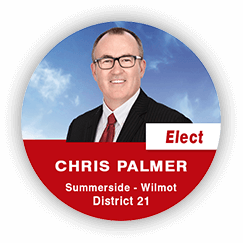 In 2010, he was elected Councillor for Ward 3, Tea Hill, for the Town of Stratford, and re-elected in 2014. He served as Chair of Finance & Technology 2010 – 2018, and Deputy Mayor 2015-2018. While on council, he presented eight balanced budgets, held the line on taxes and promoted Stratford as a sustainable community. A 25 year resident of the district, Randy has been an active volunteer. Ten years with the Board of Pownal Minor Hockey, President 2016-2018. Also Co-Chair of the Rodd Hotels and Resorts Pownal A Tournament. He has also served as President of the PEI Road Builders and Heavy Construction Association. Randy is an active member of St. Andrews United Church in Vernon Bridge. He and his wife Beth reside in Stratford and have two children, Alycia and Dylan.